Home » Why Study an ASIQUAL Qualification? Flexible ASIQUAL qualifications offer a low cost alternative to full university courses. Students are able to achieve a degree level or master’s level qualification with ASIQUAL for a fraction of the price charged by many universities. Students can significantly reduce the cost of a university degree by taking an ASIQUAL qualification as part of our University Progression Routes. An ASIQUAL level 5 Diploma may be eligible for entry into final year of a degree programme, and a level 7 Diploma for top-up to a master’s degree. Students are increasingly looking for flexible qualifications which can offer a balance between work, study and other commitments. 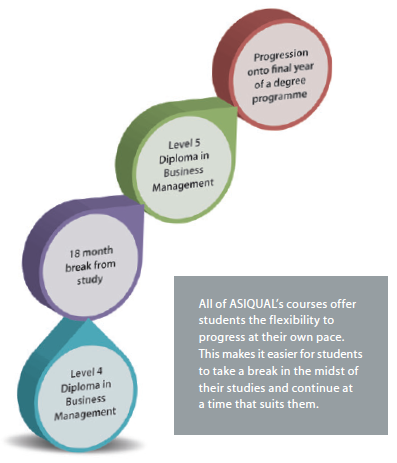 ASIQUAL programmes offer one year long diploma courses which can act as stand-alone qualifications, or can build upon each other to lead to a degree or master’s level qualification. Our ASIQUAL certificate courses provide further flexibility. If students do not wish to complete the full diploma they can take one of our smaller certificate courses, either as a stand-alone qualification or with a view to progressing onto an ASIQUAL Diploma course at a later date. 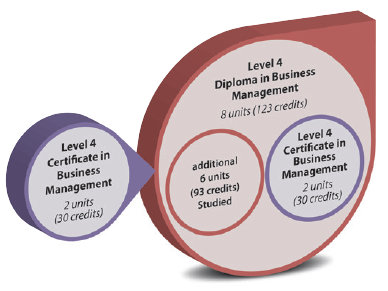 The credits the student holds from the level 4 Certificate can be used towards the level 4 Diploma, helping the student to achieve the larger qualification without having to repeat those units.